A hero's journey is filled with many great challenges. Like saving the townfolk from a mysterious invading army from another dimension, that's headed up by a hooded figure who's actually being manipulated by an otherworldly dragon who'll morph into a demon when close to being defeated. It's all in a day's work for Bravely Scoop in Bravely Scoop IV: Eternal Fantasy! 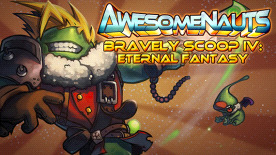 This DLC contains a custom skin for Scoop in Awesomenauts, and comes with a fully customized voice set!